The Maldives are for many a dream destination, so when we got the opportunity to stop over for half a day on our way to Sri Lanka, we went for it. 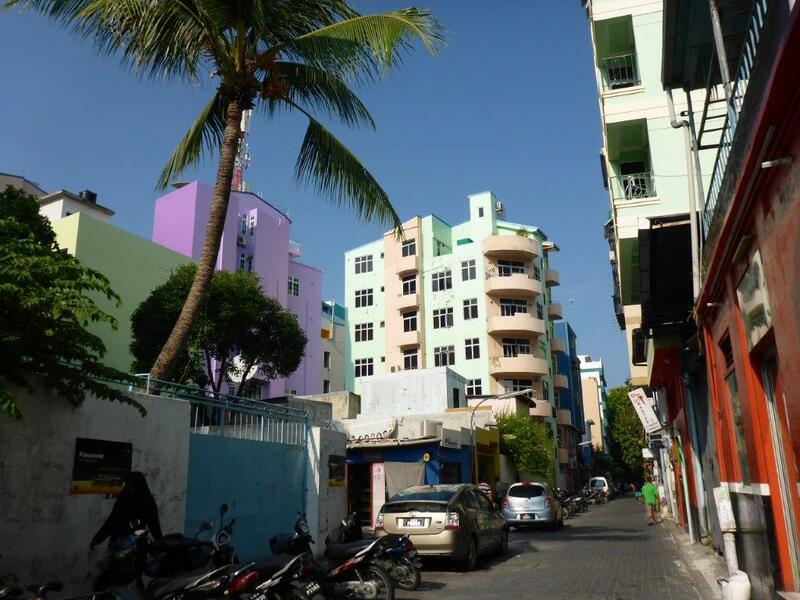 The country counts 19 atolls of different sizes. 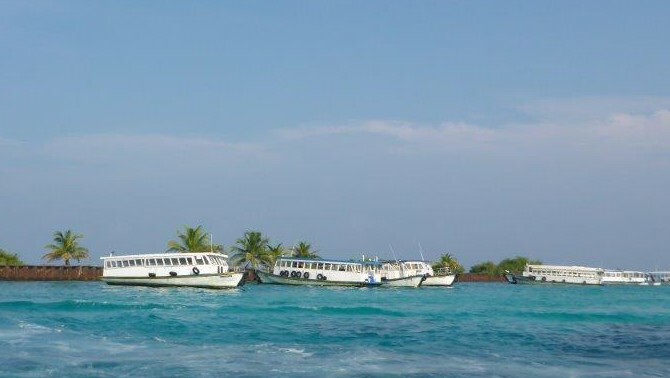 The airport is on a small island more or less in the middle of the line of atolls, with the capital Male only a short boat ride away. 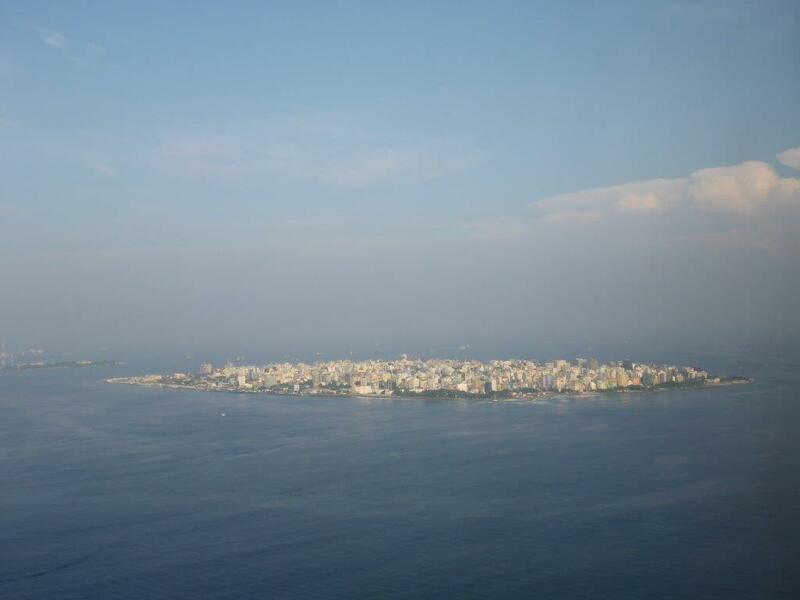 Male seen from the air. Our luggage was checked through all the way, but we still wanted to get rid of most of our hand luggage, not to mention the warm clothes we had been wearing. We found the baggage storage charging 5$ a piece, or 10$ for larger ones. 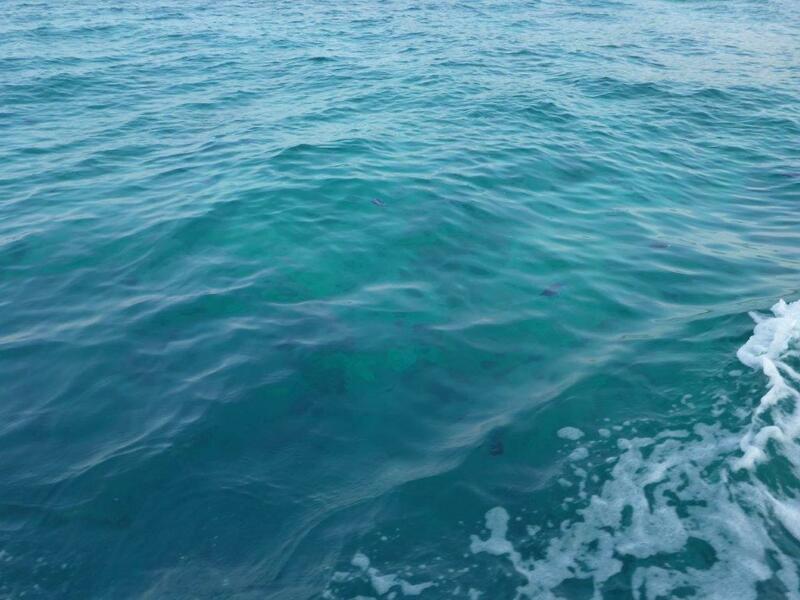 Anyway; right when we stepped outside the terminal building, we saw the turquoise water all over. 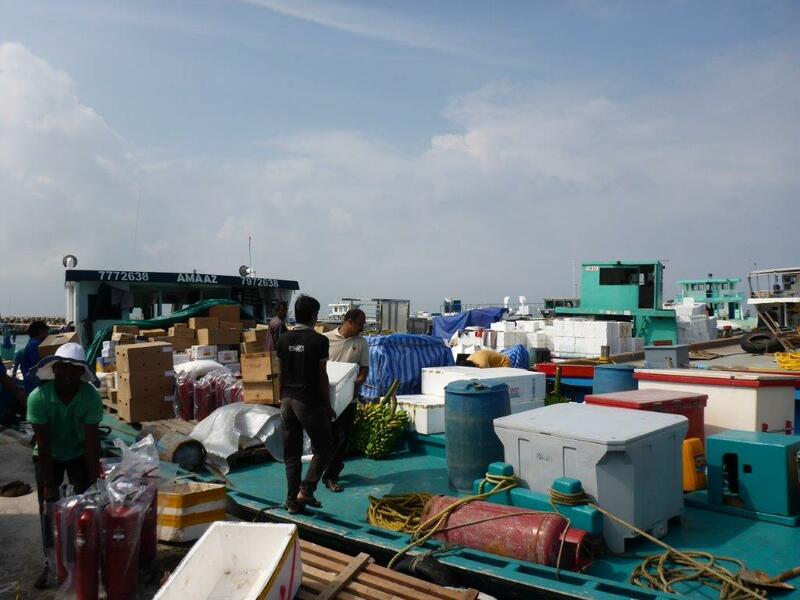 The boat to Male leave outside the domestic terminal every 10 minutes most of the day, costing 10 MVR per way. On the way you will most probably spot quite a lot of multi-coloured fish, so you can call it a very cheap trip to the aquarium! 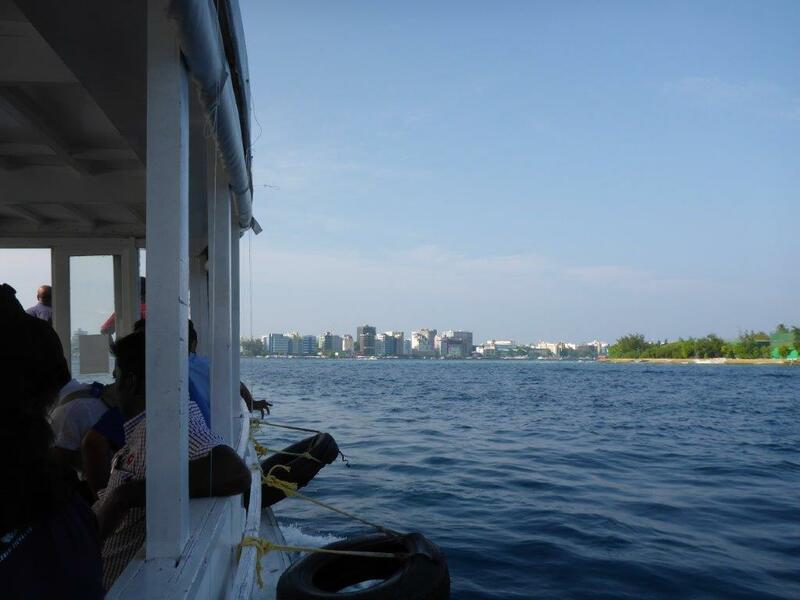 Boat from Male airport to the city. Passing over a huge aquarium. We decided to start with a walk around town. Literally. Meaning also to walk around the entire island. We crossed over to the other side, passing a mix of grey and shining colourful houses, reaching a pedestrian walkway along the water. 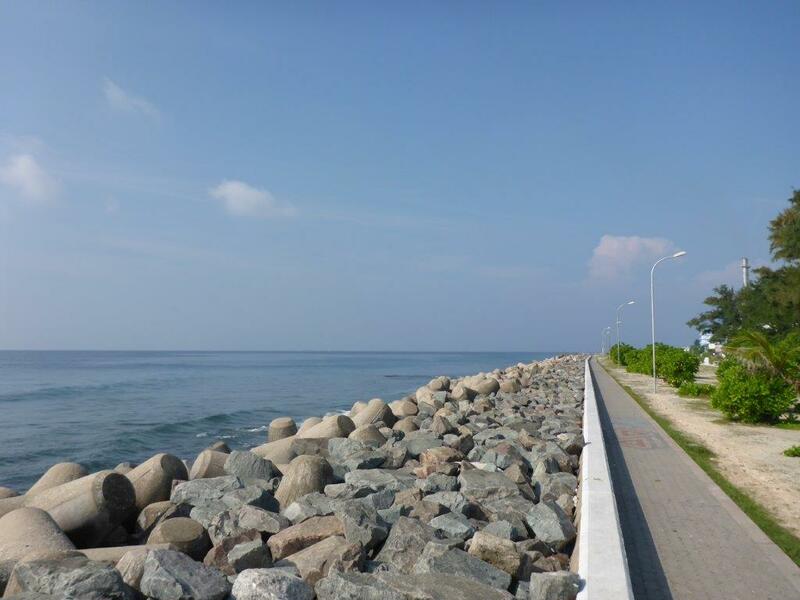 Pedestrian walkway along the sea. 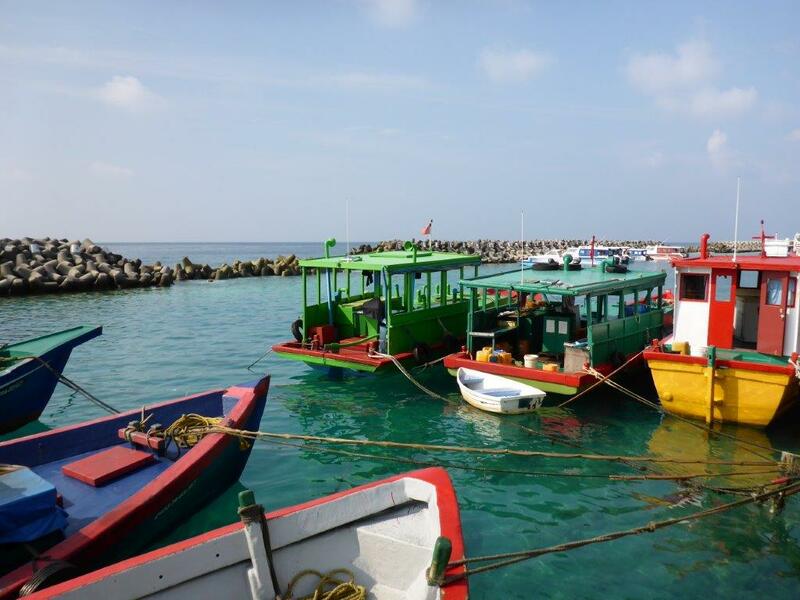 Some parts are not much more to see than the sea, but we stopped to get some fresh orange juice in the shade at Café Thaaseer overlooking the jetty. As we went along, we passed the commercial harbour and a line of restaurants right beside it. We were not hungry quite yet, and moved on. The fruit and vegetable market looked inviting, working up our appetite. Bananas seemed to be the big thing, but other fruits as well as all sorts of vegetables were available. 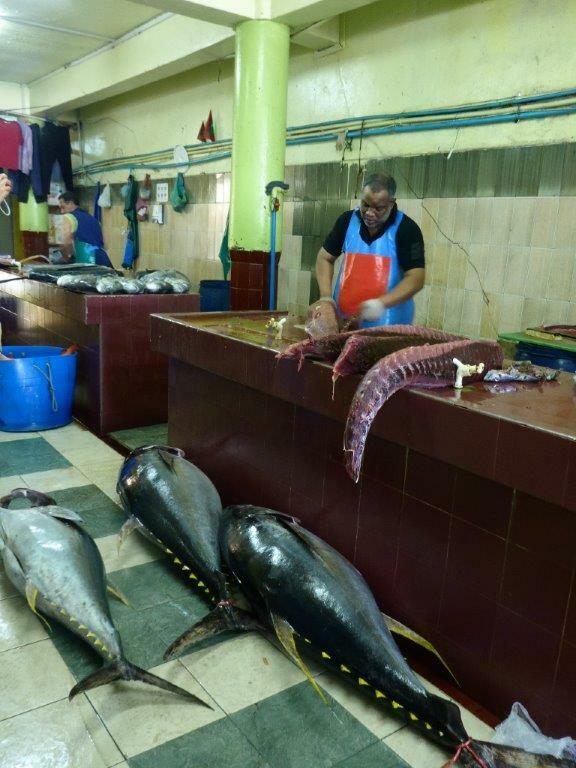 Just a stone throw away, we stumbled upon the fish market. It is said to be most lively in the late afternoon, but it seemed quite energetic already. 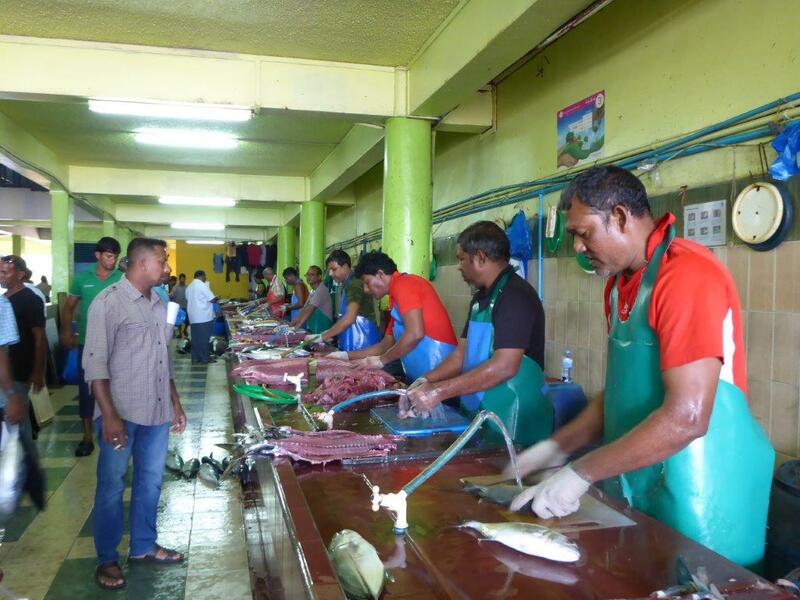 The fishmongers were lined up, preparing the large fish (like huge tuna) to be sold piece by piece. 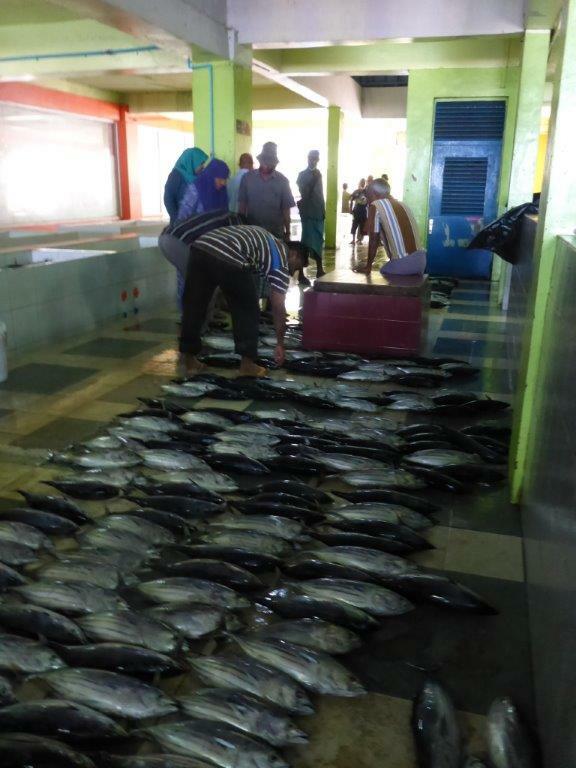 At another end of the market, smaller fish were laid out on the ground for the buyer to pick their favourite. Great fun to experience! 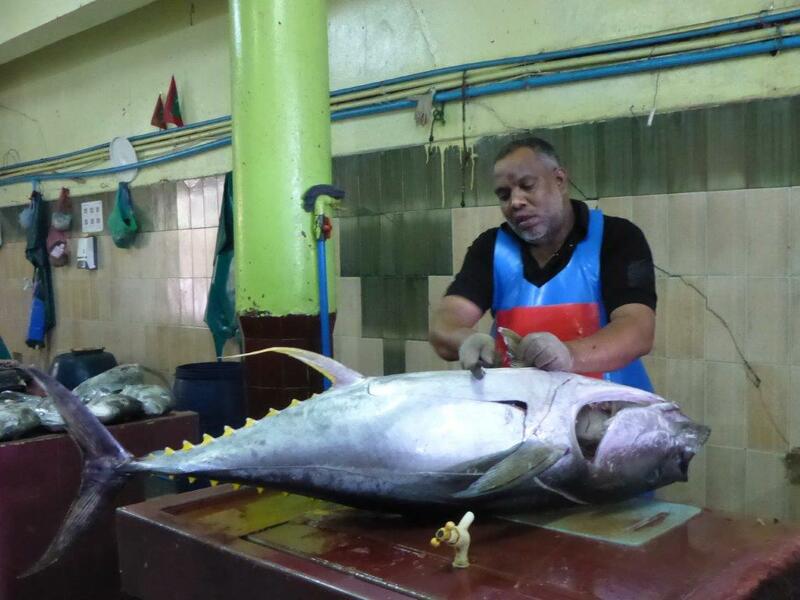 From the fish market, we passed the ships coming in with today’s catch, needing two men to carry each one of the huge tunas. A part of the everyday life in the harbour. Ships loaded with goods at the commercial harbour. 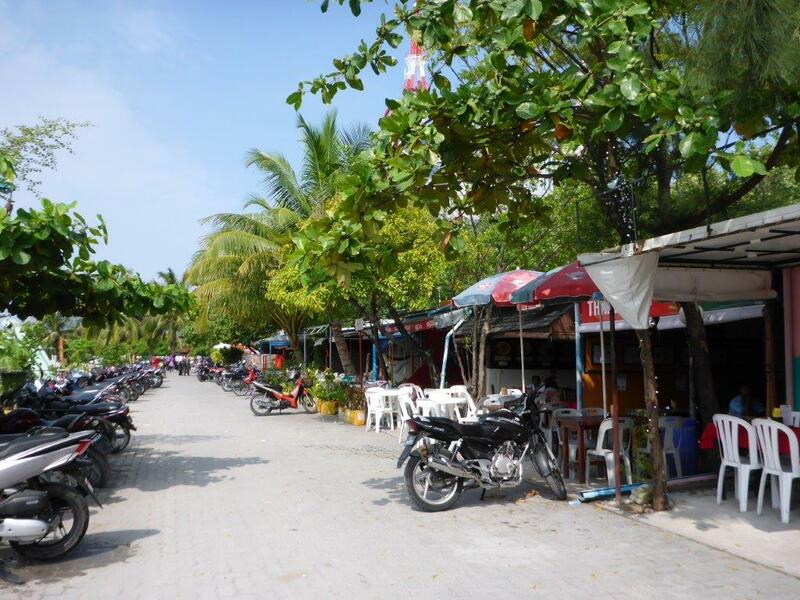 A row of restaurants by the commercial harbour. 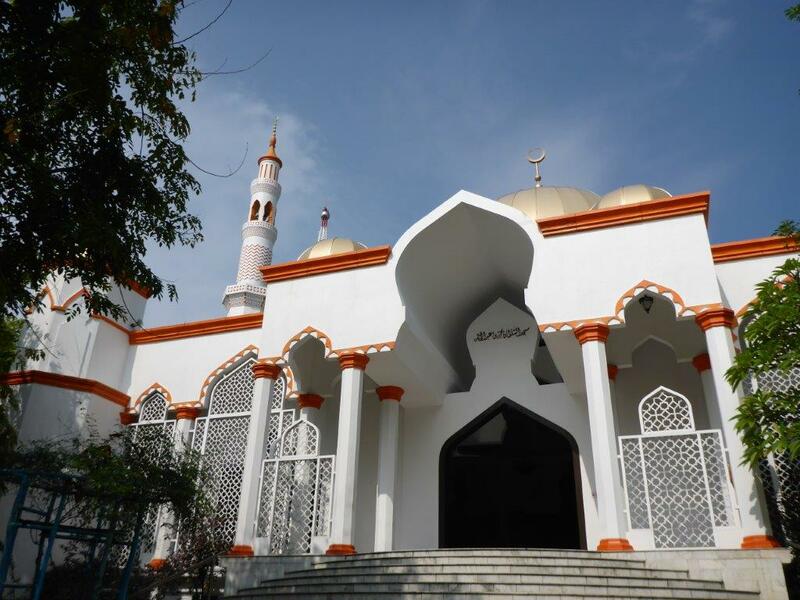 A mosque. 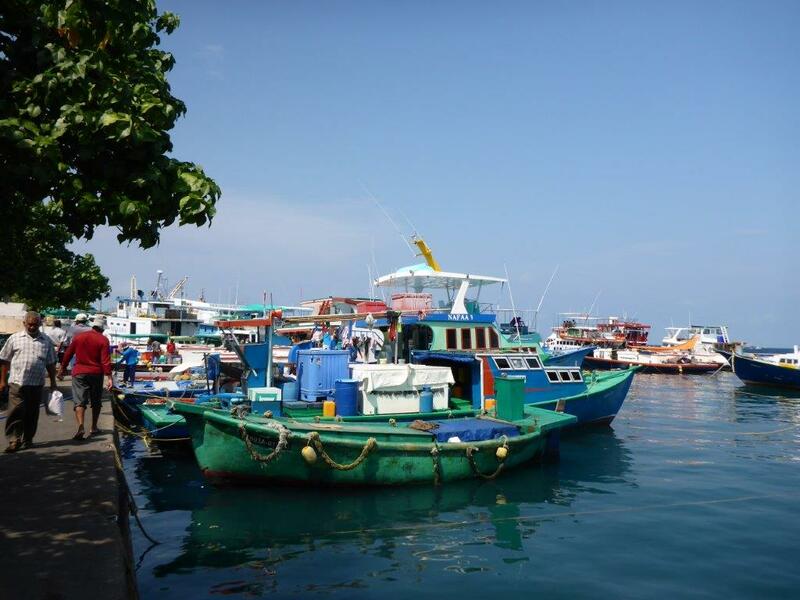 100 % of the inhabitants of the Maldives are Sunni Muslims. 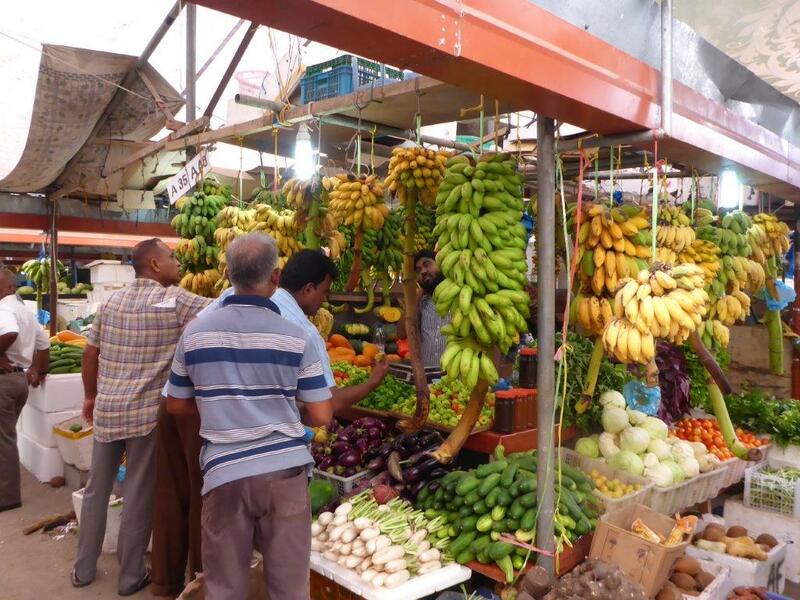 Bananas are a big hit at the fruite and vegetable market in Male. 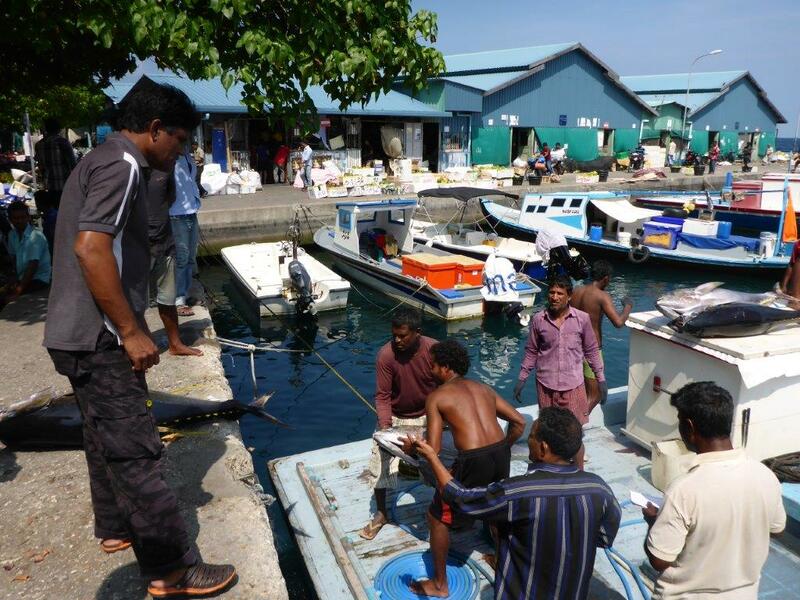 Fishmongers preparing their fish at the fish marked in Male. Fish coming in at the harbour. The heat was picking up, as well as our appetite, so we walked over to the artificial beach and hid in the shade at Break Water restaurant. 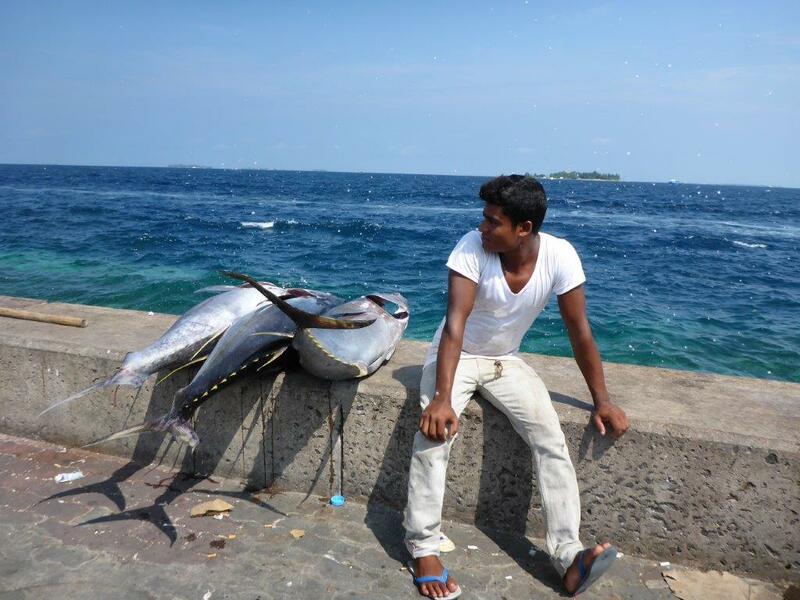 With only one day in the Maldives, I off course had to try one of the traditional Maldivian cuisine dishes; Garudhiya. It is a clear fish broth, usually served with pieces of tuna, mine being no exception. In addition, it had peppers, chili, some onions, and was served with rice on the side. Delicious! 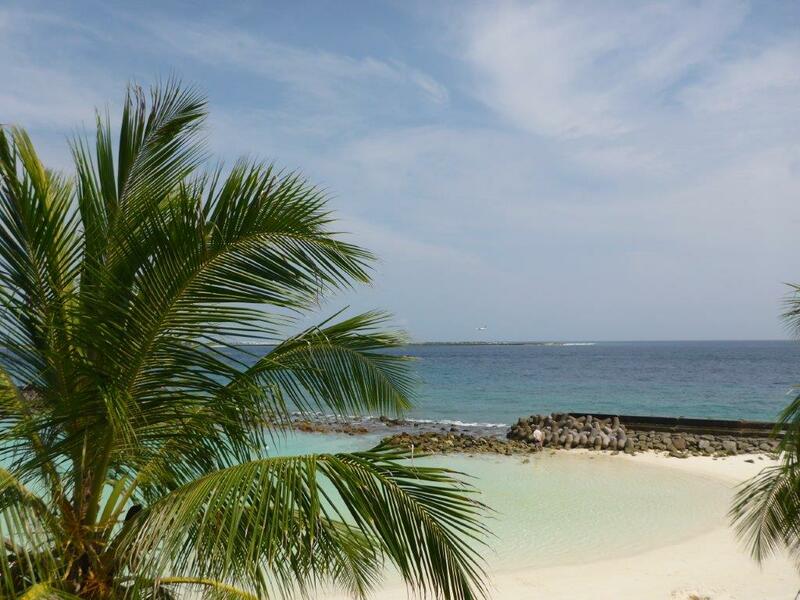 While eating we had great view of the artificial beach, as well as the planes arriving at the airport island nearby. Great place for plane spotting, if you are into that! We on the other hand, were more tempted by the cooling ocean. It turned out not to be that cooling after all, but still nice to wade around, feeling the slightly difference from the air temperature. Bikinis are frowned upon outside the tourist resorts, so no swimming this time. Great view with plane spotting by the artificial beach. 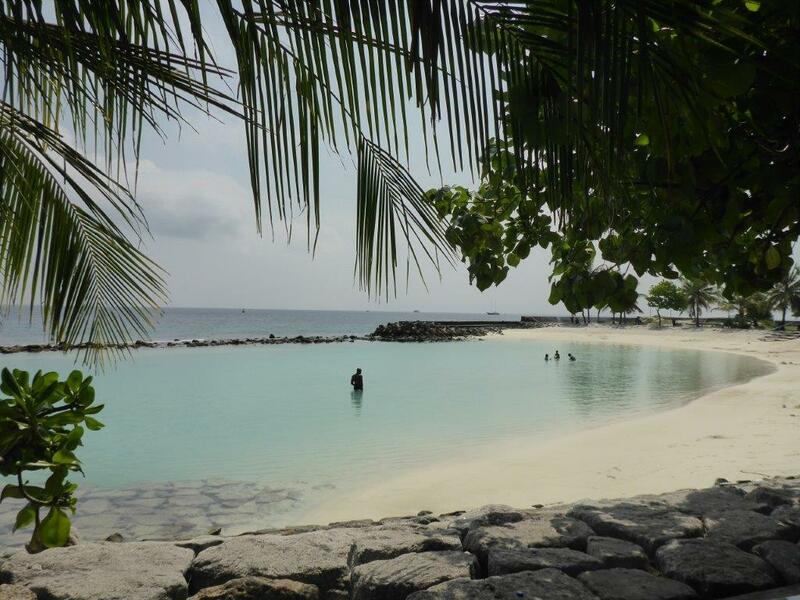 The artificial beach in Male. The stopover was absolutely worth the experience, and a great start of our onward journey to Sri Lanka. I also read the same online prior our trip, but we did not have any problems. We just walked through the passport control, left our hand luggage at the luggage storage, and jumped on the boat to Male city. PS: remember to bring a small sunscreen, the sun is strong! If you need any tips for Sri Lanka, feel free to check out my posts from there as well; http://www.travellinn.net/category/sri-lanka.